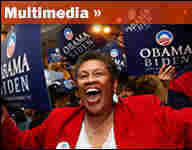 Obama Sails To Sweeping, Historic Victory Democrat Barack Obama was elected America's 44th president and its first African-American commander in chief Tuesday night, in a sweeping victory that cut across race, demographics and geography. Barack Obama addresses supporters during his election night victory rally at Chicago's Grant Park, Nov. 4, 2008. 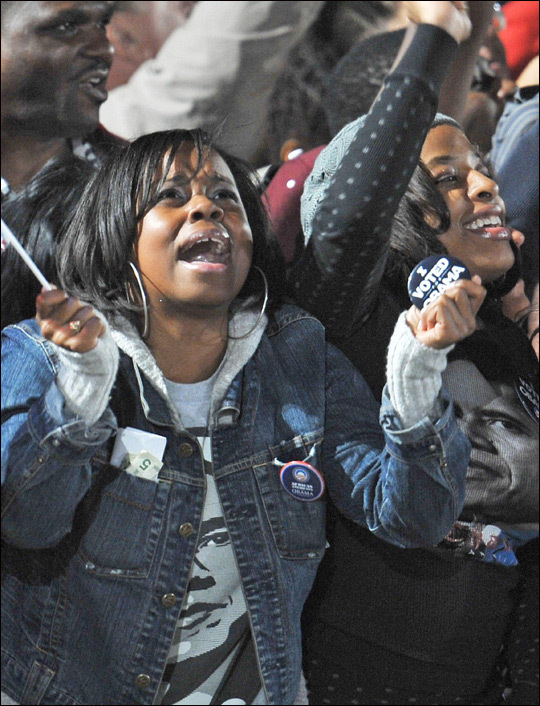 Supporters of Barack Obama celebrate his victory in Chicago's Grant Park Tuesday night. Democrat Barack Obama was elected America's 44th president and its first African-American commander in chief Tuesday night, in a sweeping victory that redrew the country's political map. In his acceptance speech before a throng of emotional supporters in Chicago's Grant Park, Obama echoed the main theme of his campaign, saying, "Change has come to America." But he also acknowledged the enormousness of the task he faces. "For even as we celebrate tonight," he said, "we know the challenges that tomorrow will bring are the greatest of our lifetime — two wars, a planet in peril, the worst financial crisis in a century. " Republican John McCain conceded the election shortly after 11 p.m. EST, telling supporters in Phoenix that Obama "has achieved a great thing for himself and his country" with his historic win. Obama's Electoral College landslide included all of the states that voted Democratic four years ago. But he also won a number of key states that had supported President Bush, including Ohio, Colorado, New Mexico, Iowa, Virginia and Indiana --the last two of which had not voted for a Democratic president since 1964. Obama also captured voters across income and education levels, age group and race. He trailed McCain among the white vote, though he did better among this group than John Kerry did four years ago. 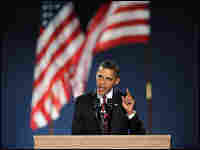 Obama's win comes as Americans face the worst economic crisis since the Great Depression, and the dramatic downturn played to his advantage. Exit polls Tuesday showed the economy was the main issue on voters' minds, and two-thirds said they were worried or very worried that the crisis will affect their families. The day brought big gains for Democrats in the House and Senate as well. Throughout the nearly two-year campaign, Obama himself rarely raised the historic significance of his race. Asked in an interview with 60 Minutes why he didn't talk more about the fact that he is African-American, Obama smiled and said he figured people could see that. But the nation's first black president-elect is an emotional milestone for many others. "We have witnessed a nonviolent revolution, a revolution of ideas," Rep. John Lewis of Georgia told NPR. Lewis shared the stage with the Rev. Martin Luther King Jr. the day the civil rights leader delivered his "I Have a Dream Speech" and said he was thinking of King as Obama's strong showing became apparent. "I felt like shouting, but I just said, 'Hallelujah, hallelujah,' 'cause I knew Martin Luther King himself was looking down on us saying, 'Hallelujah,' " Lewis said. Obama did often discuss his biracial biography — son of a mother from Kansas and a father from Kenya — and argued that he could bridge the country's long-standing racial divides. His candidacy energized African-Americans, who turned out as never before. They increased their share of the electorate to 13 percent, and nearly one-fifth were first-time voters. Some said they never imagined a black man would be elected president in their lifetime. In his acceptance speech, Obama mentioned one voter in Atlanta, 106-year-old Ann Nixon Cooper, born a generation past slavery, at a time when she could not vote because she was black and a woman. In Cooper's lifetime, "a man touched down on the moon," Obama said, "a wall came down in Berlin, a world was connected by our own science and imagination. And this year, in this election, she touched her finger to a screen, and cast her vote, because after 106 years in America, through the best of times and the darkest of hours, she knows how America can change." McCain acknowledged Obama's achievement in his concession speech and said, "Let there be no reason now for any Americans to fail to cherish their citizenship in this, the greatest nation on Earth." Obama's coalition of support goes well beyond the African-American community. He is the first Democrat since Jimmy Carter to win a majority of the popular vote, a vindication of his "50-state strategy" that even some in his own party once viewed as quixotic. By the end of Tuesday, broad swaths of the American political map that had been solid red in recent elections had undergone a dramatic transformation. "It's possible that he will be the reverse Reagan," says Columbia University historian Manning Marable. 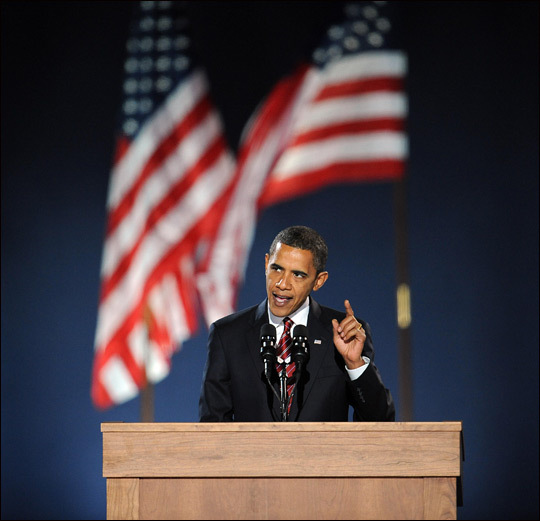 Like Reagan, Marable says, Obama is a charismatic leader whose appeal transcends partisan politics. He says Obama has built his support on a "three-legged stool" made up of African-Americans, Hispanics and young voters of all races. In North Carolina, for example, exit polls show 73 percent of 18- to 29-year-olds voted for Obama, even though McCain was stronger among every other age group. In Virginia, exit polls showed Obama ahead with every age group except those 65 and older. There are also 1.6 million more Hispanic voters this year, including a half-million newly naturalized citizens, and they chose Obama over McCain by a margin of 2 to 1. Hispanics make up large parts of the electorate in the key swing states of New Mexico, Colorado and Nevada, all of which Obama carried. Adding to Obama's advantage, there are simply more registered Democrats than Republicans now. Republicans have dropped from 37 percent of the electorate in 2004 to 32 percent today, as the number of Democrats and independents has increased. Obama also had the best-financed campaign in memory, using the Internet to solicit a large number of new donors and breaking a promise to accept limited public financing for the general campaign. This allowed Obama to blanket the airwaves with ads attacking McCain on the economy, his health care plan and other issues. McCain, too, aired a series of negative ads, and the last few weeks of this nearly two-year-long battle turned bitter. Twice in his concession speech, when McCain mentioned Obama's win, the crowd erupted into boos. McCain quieted them, urging all Americans to "find the necessary compromises and bridge differences." In his speech, Obama also reached out to McCain's supporters. "I may not have won your vote," he said, "but I hear your voices, I need your help, and I will be your president, too." Much of Tuesday night's electoral shift can be attributed to President Bush's dismal approval ratings, which posed a burden for McCain. Obama consistently sought to link the two, asserting that McCain's economic policies in particular would be a continuation of Bush's. 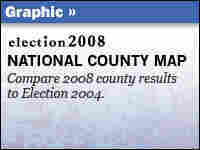 At one time it was thought this election would turn largely on the war in Iraq. McCain touted the success of the so-called troop surge — a measure he pushed for and Obama opposed — saying that the strategy improved security in that country. But most Americans now believe the war was a mistake, and exit polls show that only 1 in 10 voters considered Iraq an important election issue. The impact of McCain's choice of Alaska Gov. Sarah Palin as his vice presidential running mate is not so clear. Before the election, polls showed that a majority of Americans believed she was unprepared for the job. But exit polls were mixed — 59 percent of voters said Palin was a factor in their choice, but they split their votes between the two candidates. The loudest cheers during McCain's concession speech came when he thanked a teary-eyed Palin, calling her "an impressive new voice in our party." The sweeping support for Obama carried over into some congressional races, with Democrats picking up at least five seats in the Senate. But a prime target — Senate Republican Leader Mitch McConnell of Kentucky — held on, and Democrats fell shy of the vetoproof majority of 60. Democrats made double-digit gains in the House, where all 435 seats were up for election. In the last weeks of his campaign, McCain repeatedly invoked the prospect of a Democratic-controlled Congress to suggest that only he could provide a check on unfettered liberal control of Washington. Now even some Democrats are calling for moderation. "We can't get too ecstatic," New Mexico Gov. Bill Richardson told NPR. His own state went for Obama this time, but it has been closely split between the two parties in past elections. "I think if we don't build coalitions and govern in a bipartisan way, we're going to have some problems."